“I keep thinking about this river somewhere, with the water moving really fast. And these two people in the water, trying to hold onto each other, holding on as hard as they can, but in the end, it’s just too much. The current’s too strong. They’ve got to let go, drift apart. That’s how I think it is with us. […] But in the end, we can’t stay together forever. It is sad that people are comparing Ishiguro and Murakami by virtue of their being Japanese. That’s like saying you should read Atwood instead of reading Munro (you know, since they’re both Canadian). Anyway, Ishiguro and Murakami have entirely different subject matters and styles, so there’s no comparison. For me, Ishiguro is the better writer, mostly because of the subtle ways in which he translates meaning and develops plot, kind of like Atwood. “Never Let Me Go” is one of the best novels I’ve ever read. It nearly beats out “Disgrace” as one of my favorites this year. Strangely enough, “Never Let Me Go” is on TIME Magazine’s list of 100 Greatest Novels of All Time, but “Disgrace” isn’t. I can’t quite understand that, but oh well. 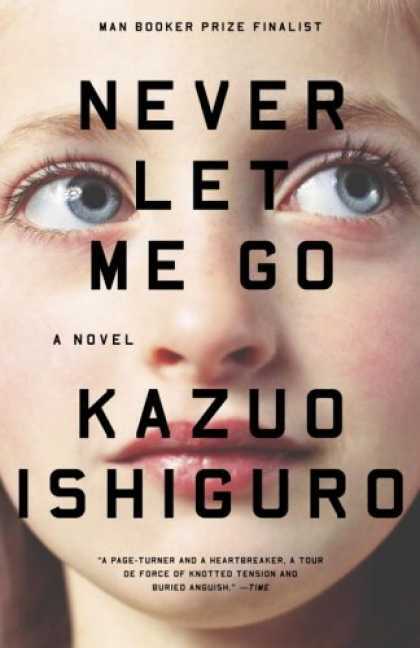 “From Booker Prize-winning author Kazuo Ishiguro comes a devastating new novel of innocence, knowledge, and loss. As children, Kathy, Ruth, and Tommy were students at Hailsham, an exclusive boarding school secluded in the English countryside. It was a place of mercurial cliques and mysterious rules – and teachers were constantly reminding their charges of how special they were. Does that really tell you anything? No. The novel is set in late 1990s England, though through flashbacks, Ishiguro moves the narration anywhere between the 60s and present time. The story is a coming of age saga revolving around three different kids: Ruth, Tommy, and Kathy (the narrator). Kathy is a thirty one year old carer who takes care of donors. Don’t ask me to explain that one. She and Ruth and Tommy grew up at Hailsham, and the novel is separated into three parts: part one deals with their early years at Hailsham, part two moves us closer to the present, with their departure into the real world, and part three brings us to the present time, where all three are reunited for a brief moment. To be absolutely blunt, “Never Let Me Go” is a dystopian novel, firmly balanced on the shoulders of Huxley’s “Brave New World,” Atwood’s “The Handmaid’s Tale,” and Orwell’s “1984.” At its heart, the novel questions what it means to be human and how we should live our lives. It is also a love story and a mystery with no ultimate revelation. If I were to give a major spoiler, I would say it is most like one of Jodi Picoult’s novels, but for the literary, intelligent reader. Ishiguro’s talent is letting the reader know what his narrator and the rest of the characters don’t. We are simultaneously told and not told, just like the students, what is going on. Before we are halfway through the novel, before one of the minor characters reveals the nature of the students’ special nature, the reader already knows. The only question, then, is how will the characters find out, and what happens afterwards? Ishiguro is a master of subtlety, and it shows clearly at the end, when all the small clues illuminate the larger picture of what it means to be alive and to create and to love and to really live. I think part one and part three are superb. Part two becomes tiring due to Ishiguro’s use of flashback and having the narrator announce that something is important and then explaining it. You have to read through this part in order to get to the heartbreaking and agonizing conclusion. And what a conclusion it is, what an absolutely despairing outlook on the reality of what we choose to do for other people. A measure of a good writer is the title he or she chooses for the work. In this respect, Ishiguro, much like Atwood, has struck gold. The title plays to all aspects of the novel: the love story, the dystopia, the mystery. If you also look at the cover, you’ll see a spoiler (sort of). The cover was designed by Jamie Keenan, who’s done some great work. This is one of the few novels that has made me cry. These characters try to live their lives and ultimately do live them, but to what purpose? Theirs are not the kinds of lives you would wish to live. Final note: I could spoil this novel with one word, but I won’t. Don’t read Amazon reviews for this novel, because you will lose a major part of what it is about, the fear and tension of not knowing what happens next.